Jerry Allan, one of the original designers of the globe. The first hand painted Earth Balloon was completed in time for the United States Bicentennial in 1976. This original Earth Balloon has been used by organizations such as Jacques Cousteau and the United Nations. By the late 1980's the original hand-painted globe came into disuse. 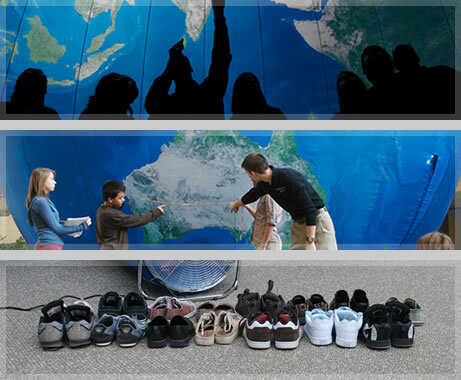 In 1992 the idea of using the Earth Balloon as a teaching tool was revived by David and Audrey Knutson. In 1992, David Knutson formed Earth Balloon, Inc., trademarked the name “Earth Balloon” and hand-painted his first Earth Balloon. Six additional 22’ Earth Balloons were hand painted by Knutson from 1992-2001. These hand-painted Earth Balloons were purchased by museums and non-profit organizations. In 2001 Earth Balloon, Inc. received satellite imagery from NASA and transitioned from hand-painted globes to high-resolution satellite image printed globes. In 2007 Stefan Knutson joined the Earth Balloon team as Marketing Director. 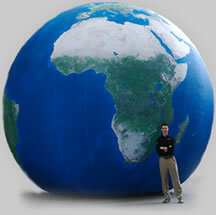 The Earth Balloon is the highest quality large scale globe available. As Earth Balloon, Inc. looks to the future, we will continue to refine our globes to better serve the public. © 2011, Earth Balloon, Inc. Earth Balloon is a registered trademark of Earth Balloon, Inc.